Knight Chess set. Silver and Bronze Finish. 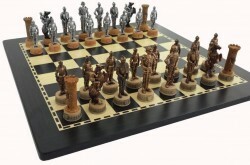 Chess men arrive in a nice box with protective casing. Beautifully detailed. The chess men are hand painted and solid cast resin. Very nice quality board made in Italy. All boards and chess pieces are felted on the bottom. King measures 8.5 cm tall. Board 40 x 40 cm (16 x 16 inches).